A lightweight dual purpose herbal formulation developed scientifically to ensure the herbs and botanical extracts used do not lose therapeutic properties thus ensuring optimum results. The sun's rays contain two types of ultraviolet radiation that reach our skin: UVA and UVB. UVA radiation is what makes people tan while UVB radiation causes sun burns. 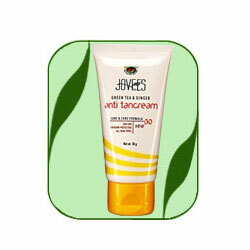 This cream will help in protecting your skin from sun burns, tanning and premature ageing of skin. It shall also make your skin look visibly fairer and even toned. Wash face preferably with cleansing milk. Apply a small quantity on face and neck daily in the morning and evening.